Difficulty: Summer: (YDS) class 1, Spring: (YDS) class 3. 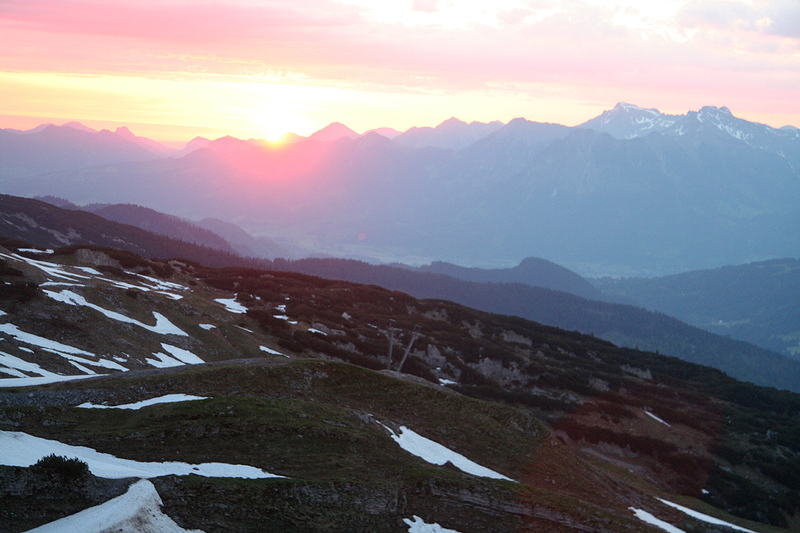 How to get there: Locate Oberstdorf in south-west Germany. 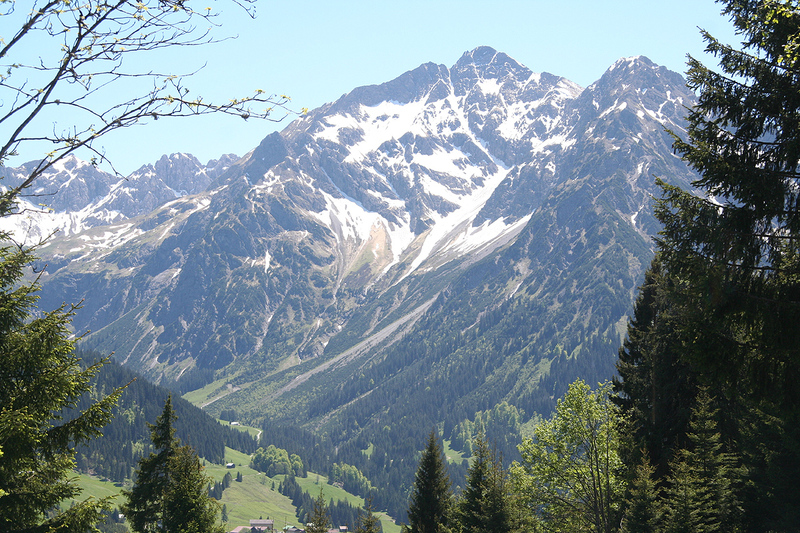 Travel south through Oberstdorf towards Kleinwalsertal, a small, isolated piece of Austria. You will enter the village of Riezlern, continue through this village. Just as you leave the village, pay attention as you cross the main river on a bridge. Just across this bridge, make a right turn onto Schwarzwasserstrasse. Follow Schwarzwasserstrasse 3.7 kilometer to its end at a large parking area next to a large building named Auenhütte. Park here, the location is N47:20.590, E010:08.288, elevation about 1280 meter. 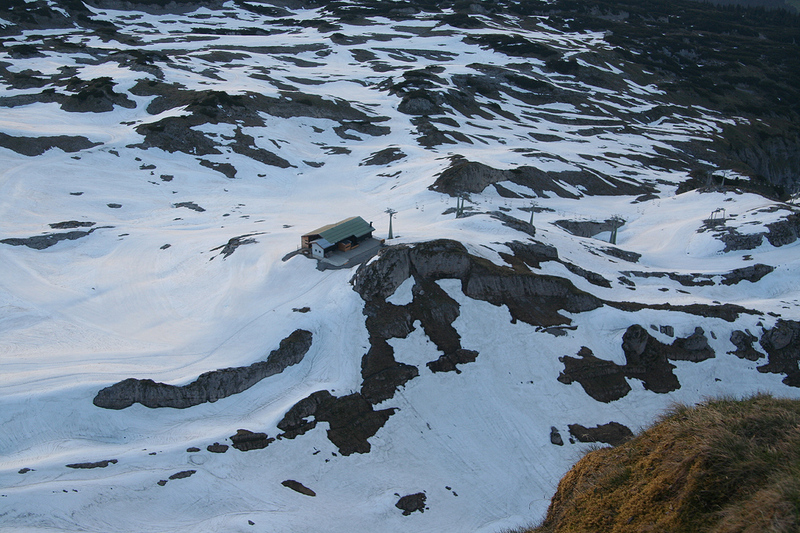 Route description: From the parking, one may take a chairlift up to the hut Ifenhütte at about 1600 meter, if it runs. Alternatively, as I did, hike up the small paved road that starts right next to the chairlift. 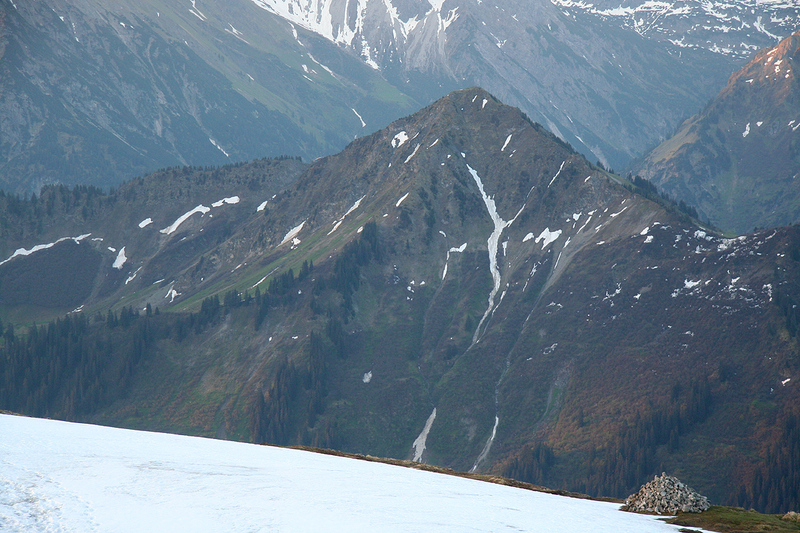 This road winds its way higher and ends at the Ifenhütte. 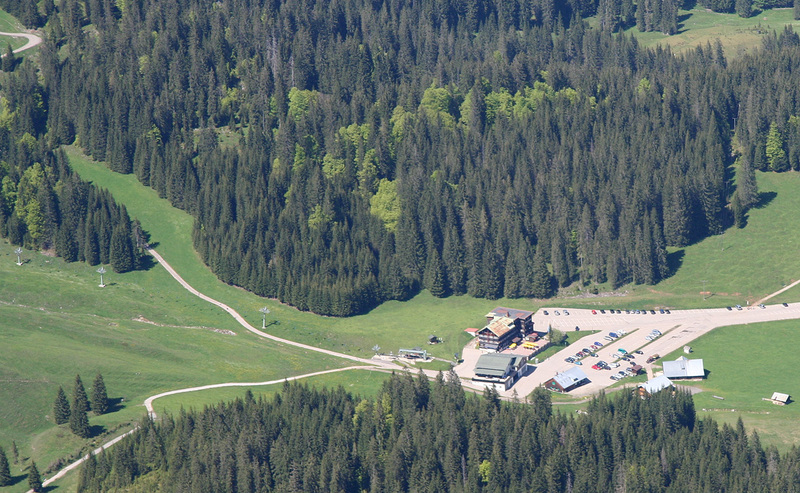 From the far side of the Ifenhütte, a very visible trail continues uphill with zig-zag turns. There are no signs, but the trail is obvious. 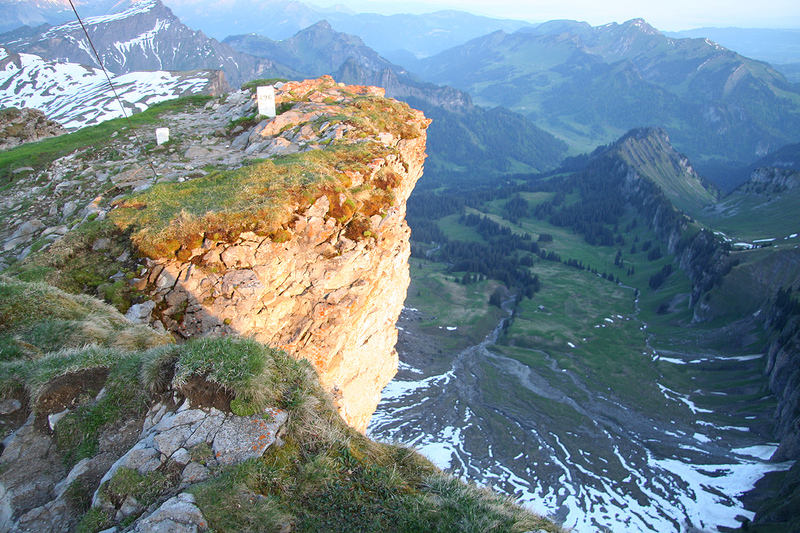 Higher up, this trail runs on the right hand side of a small valley that separates the Ifen mountain from the route. A bit below the 1900 meter level of this valley, the route runs more steeply up the slope of the Ifen and finds its way through the steep cliffs higher up. In summer, without snow, there is a perfectly fine trail, it has some rope/wire for additional protection, that is really not needed. In spring, when this slope is covered by snow, the trail (and the protection) may be buried and replaced by a rather steep snow slope. 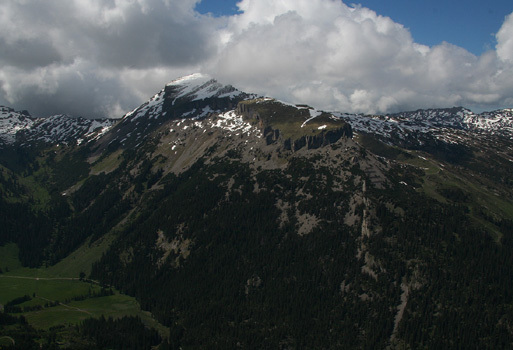 The conditions may then be difficult and an ice axe and possibly crampons may be required. The steeper section of the trail tops out on a pretty flat plateau. Follow the trail from here to the summit. June 1. attempt: I had arrived early in Kleinwalsertal, since our planned climb of Birnhorn was aborted due to a really bad spell of winter at the very last day of May. Thus, I decided to explore the local peaks and drove up to the very end of Schwarzwasserstrasse. The weather was still bad, quite a steady rain, but I was dressed properly for some fresh air despite the poor conditions. I started uphill from the parking lot at 0920 and reached the Ifenhütte hut at 1000. Proceeding uphill, I soon ran into snow that quickly got deeper. 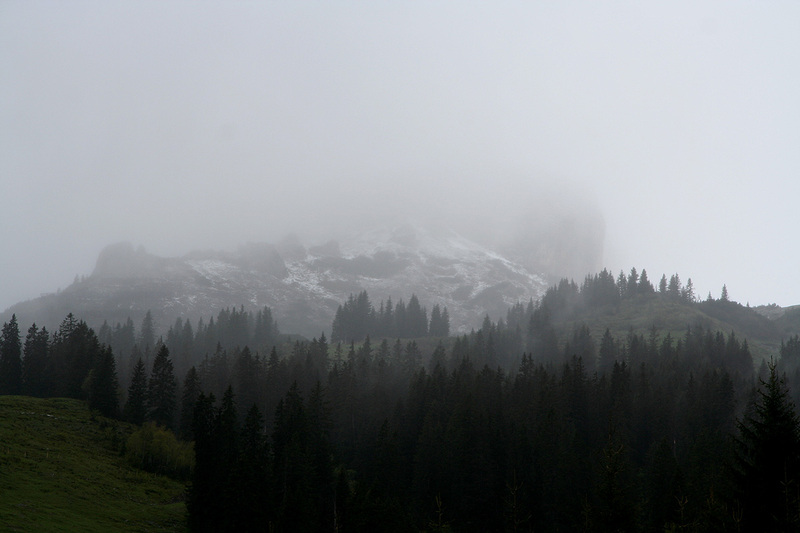 On top of this, the fog was hanging over the mountain and I could not even see the upper cliffs. I continued uphill in the small, distinct valley, hoping to see some trace of the path that should cut across and ascend the steeper slope on my left. At 1110, I was above 1940 meter without having seen a thing that could help me identify a possible route. Too bad, but I decided there was absolutely no point in any further explorations as long as the steep slope above was hidden in fog. I turned around and hiked back down to the car, arriving there at 1230. At least, I had hiked almost 700 meter vertical and struggled quite a bit when breaking trail in the snow for about one kilometer. 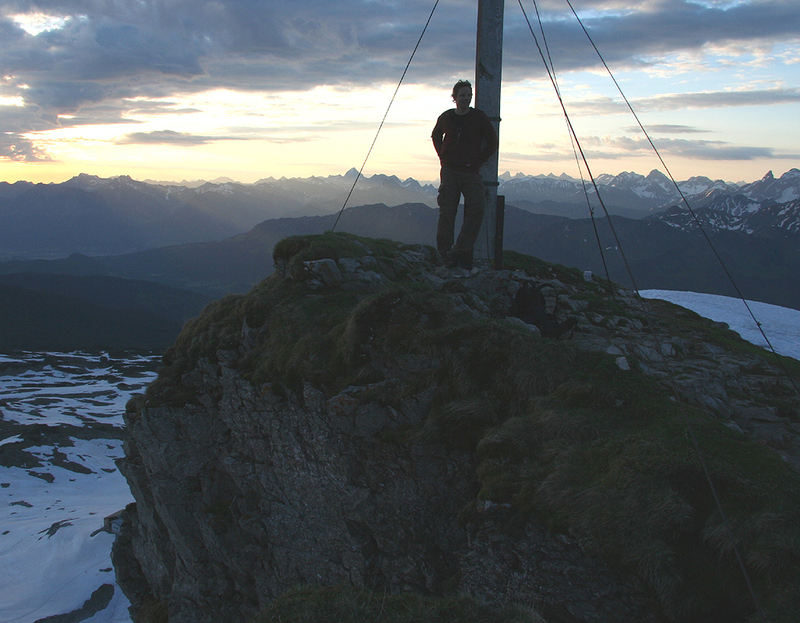 June 6. climb: After a most enjoyable ridge walk together with Christoph on Friday, we agreed to make an early morning climb of Ifen on Sunday, before breakfast. We agreed to meet outside the building at 0400 for a short drive to the trailhead parking area. Thus, we left the car already by 0410 and walked quickly up the road to the Ifenhütte, arrival there at 0440. The weather was nice and the sky bright red in the east. We made rapid progrees and were high in the basin by the time the sun rose above the horizon at 0520. The snow was hard, but quite good as we could make pretty good footsteps up the steeper snow slope. We traversed up towards the upper cliffs. Once there, things got a bit more tricky. It was clear that we needed to traverse left, but the terrain was an outward sloping shelf with grass, moss and loose rocks. This is not my favorite terrain when you have a vertical cliff below. We traversed rather carefully and reached safer ground leading to a short gully that led all the way up to the plateau. Once there, we spotted a sign about 75 meter further downslope saying: "Weg zum tal",- way down. Oh, well, we should explore the official way on our descent. For now, we walked along the trail gently uphill, crossing a few patches of snow, before reaching the summit cross at 0555. 1:45 from the trailhead, including a careful scramble, not bad at all. We enjoyed the summit views, Christoph got to taste the Kvikklunsj chocholade and we consumed some water. Looking back down at the top station of the ski lift reminded us that this mountain has pretty steep cliffs all around. Our climb on Friday of Walmendingerhorn could also easily be seen, it certainly looked lower from this viewpoint. A very nice moment with the low sun shining on the peaks all around. We left after 15 minutes and soon explored the official route. It started out nicely, but then disappeared under steep snow. 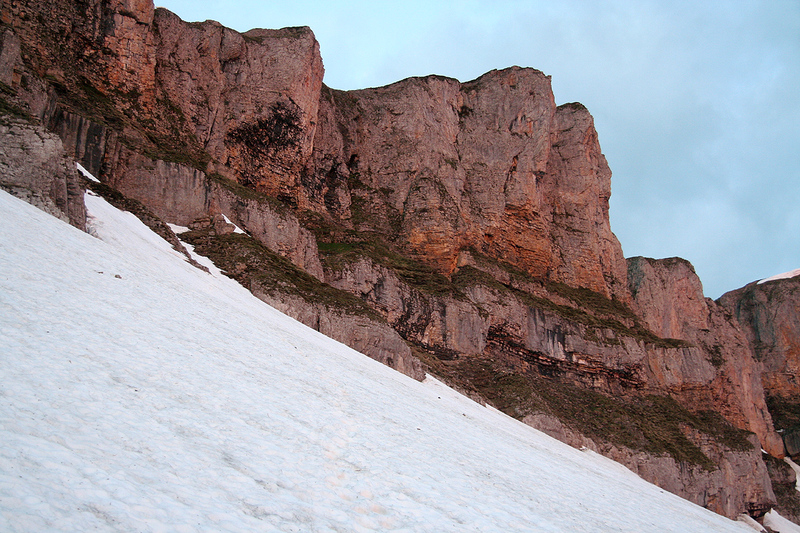 However, at this point it was realtively easy to downclimb to the snow and then follow the snow straight down. First steeply, then more gently. We were back at the car by 0730. Plenty of time to get home and have a warm shower before normal breakfast at 0800. Many thanks to Christoph for good company. 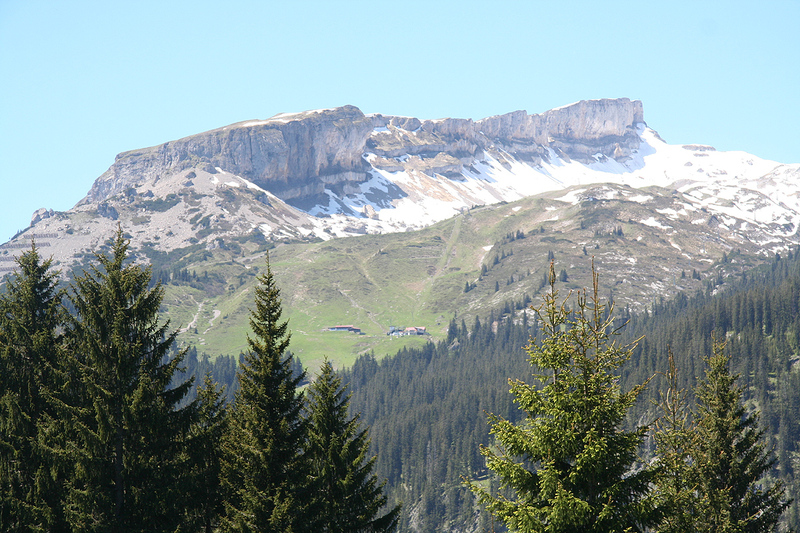 Hoher Ifen, as (barely) seen from the trailhead. 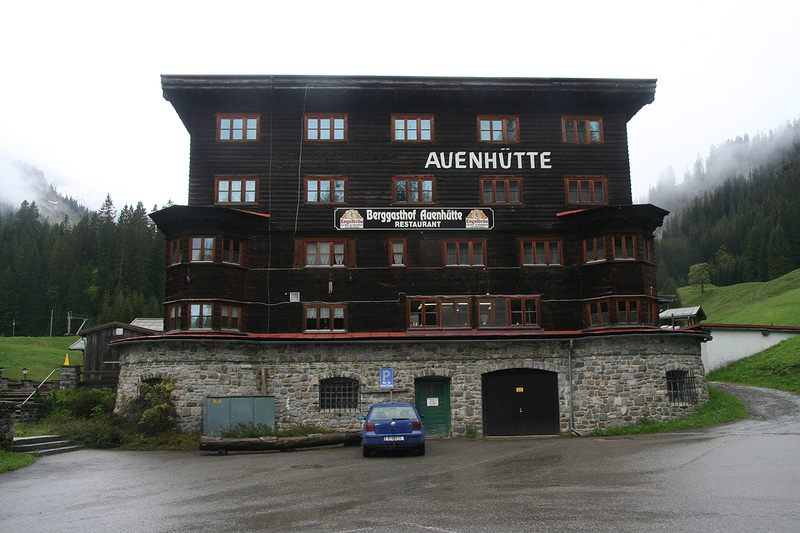 Auenhütte, this is the trailhead. 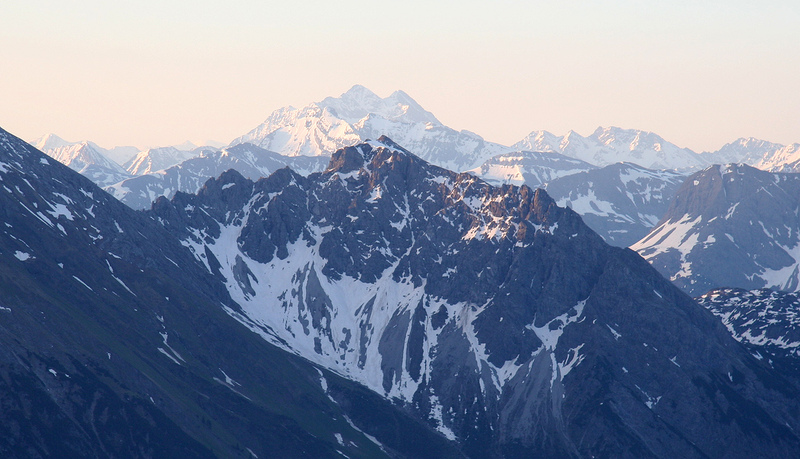 Ifen, as seen from Walmenderhorn. The trailhead, as seen from Walmenderhorn. Ifen, as seen from Söllerhaus. Widderstein, as seen from Söllerhaus. Sunrise, the time is 0520. Cliffs, the route ascends here and turns left higher up. Into Germany, this mountain is quite steep all around. 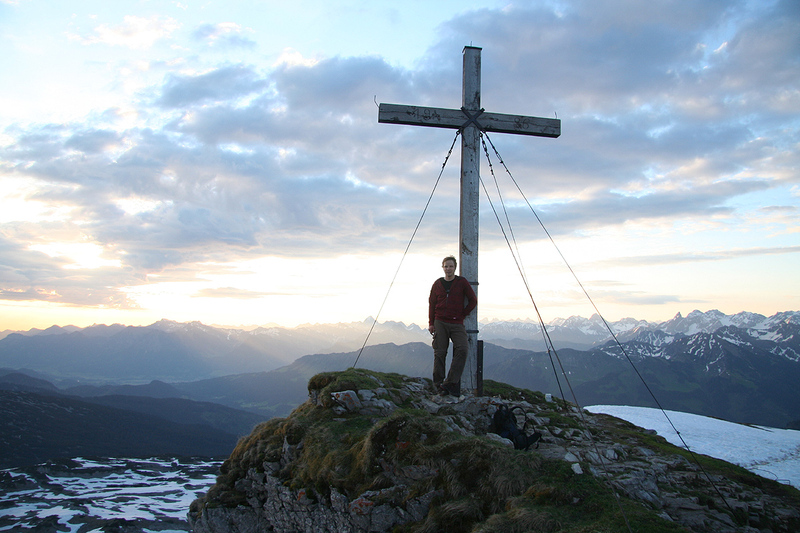 Summit view, Hoher Riffler, 3168m.